You can’t resist the finely divided feathery nearly white foliage of this great small scale ground cover. 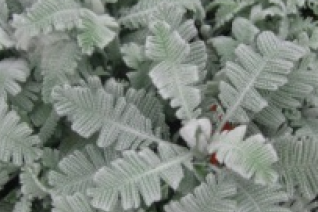 Foliage to 4″ tall and spreading to 2′ wide in full sun and well drained soil. Light summer water. Small flowers lacking petals have a center of off white/gold in early summer. Excellent performance on slopes as well as rock gardens. Evergreen. Loves life in the hellstrip.